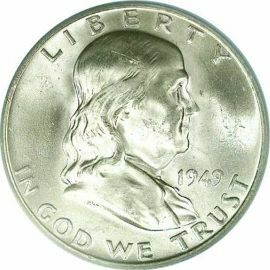 Franklin Half Dollars made their debut in 1948 and completed the transformation of American coinage from allegorical figures to portraits of famous Americans. 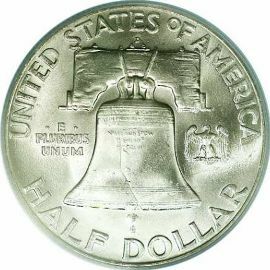 As the Walking Liberty Half Dollar neared its statutory minimum of 25 years in production, Mint Director Nellie Tayloe Ross ordered John R. Sinnock, the Mint's chief engraver to change the design. After seeing a US Mint medal produced in Franklin's honor in 1933, Ross decided this would be the theme of the new half dollar. 18th-century sculptor Jean-Antoine Houdon, contrasts sharply with the subtle, detailed depiction of Miss Liberty on the Walking Liberty coin it replaced. The inscriptions "LIBERTY" and "IN GOD WE TRUST" surround the right-facing portrait, with the date to the right of Franklin. Tucked below Franklin's shoulder are Sinnock's initials, JRS.